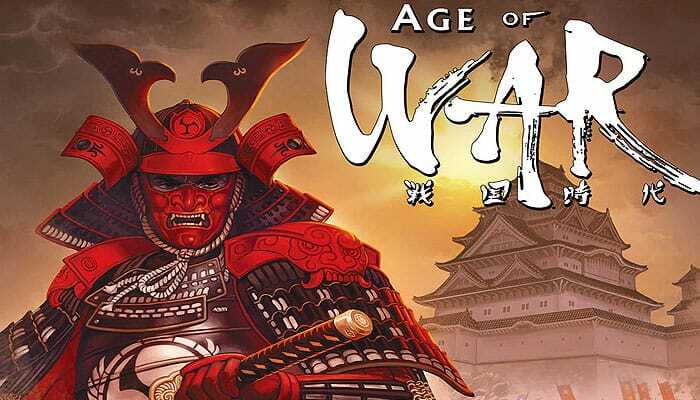 Age of War is a fast-paced dice game of conquest. 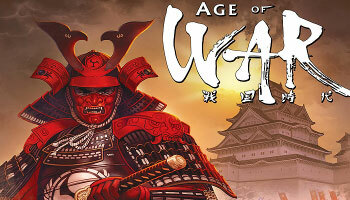 It is a time of war and strife in feudal Japan. The regional warlords battle in order to get control of the nation. Fourteen castle cards are placed on the table face up, representing the castles of regional daimyos which must be conquered. The cards indicate the combination of forces which must be defeated to claim the card. During play, you must roll seven dice each displaying six symbols: archery, cavalry, daimyo and 1-3 infantry. To claim a castle card, the results of player's dice rolls must match the forces on that card. Conquered castles grant points towards your victory and you can gain more points by uniting an entire clan and whoever has the highest score on the end wins. Place all the castle cards faceup in the center of the table so that each card is clearly visible. Place the dice near the cards within easy reach of all players. Randomly select a player to be the first player to take a turn.